"Enterprise Development with Visual Studio .NET, UML, and MSF" is for programmers dealing with or those that have an interest in developing Enterprise .NET solutions. It will guide readers through all aspects of Enterprise modeling, from design considerations and project management design processes to modeling a .NET solution using UML.In today's IT world the need for complex solutions designed the right way and delivered on time is a success factor for the entire Enterprise. 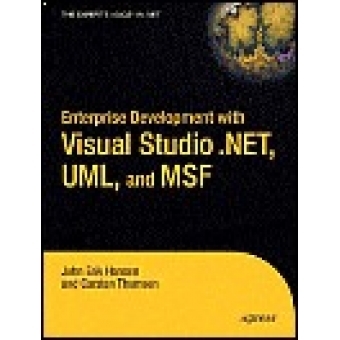 "Enterprise Development with Visual Studio .NET, UML, and MSF" will help readers succeed by providing them with guides and examples that they can use in their own .NET projects. It will cover the Microsoft Solutions Framework and how to benefit from this process when designing. Programmers can also use this book as a reference or as a step-by-step guide for creating Enterprise solutions the right way with design processes, UML, .NET Framework, and C# and VB .NET.